Climbing keeps you fit, it is fun and offers unique experiences! 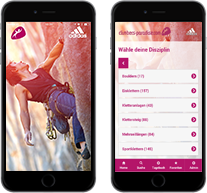 In front of the imposing backdrop of the Tyrolean mountains you will find the widest variety of different climbing possibilities in all levels of difficulty. Whether on the mountains, in the woods or on the lakes and rivers, extreme athletes and beginners alike face new challenges in the midst of intact nature - or in one of the numerous and well-equipped climbing halls. Boulderparadies Galtür (with the most difficult boulder of Tirol and the first children's boulder), the ice climbing Eldorado Pitztal, the classic routes on the historical Wilde Kaiser or the Steinplatte, One of the best sporting arenas in Central Europe. A particularly beautiful panorama can be enjoyed over the deep blue Achensee, while the Ötztal scores with a large offer of family-friendly climbing gardens. Here in Tirol, in the heart of the Alps, everyone finds their place to live their own individual dream of climbing. Indescribable sunsets, unforgettable peak moments and views of a glittering starry sky included!